I work to understand and conserve areas of unique biodiversity through a combination of research, education, and close partnerships with natural resource managers. I have a wide variety of interests and experience in topics including road ecology; large herbivore movement, migration, and habitat selection patterns; rangeland monitoring, management, and restoration; and impacts of invasive species, land-use change, and climate change on natural systems. I am based in Lander, WY where I am a Conservation Scientist with The Nature Conservancy's Wyoming chapter. 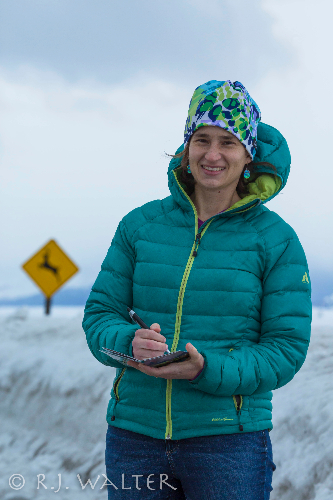 I am also a Research Associate with the Northern Rockies Conservation Cooperative and an Adjunct Associate Professor at the University of Wyoming's Department of Zoology and Physiology and Haub School of Environment and Natural Resources. The results of a study I led were recently featured on Science Friday and Here and Now. In this study, we serendipitously found that white canvas bags stuck on posts were a pretty effective way to reduce wildlife-vehicle collisions and get deer to cross rural highways in Wyoming more safely than they otherwise wood. Does this point to a long-term solution to reducing the conflicts between wildlife and roads? Maybe. Allowing animals to cross the highway safely above or below the road surface (using road under- or over-passes) is definitely a better solution, but we may be on to something that helps in places where that is not possible. It all started with a snowshoe hike in to the late Frank Craighead, Jr.'s old cabin in Grand Teton National Park one snowy day a few years ago... as his son Charlie and wife Shirley helped me find Frank's old notes, my excitement grew: here was a gold mine of data on when plants flowered and birds arrived on their summer grounds from the 1970s, before climate change really started affecting things. Three years later, the research project and citizen science program I only dreamed of then are both blossoming. Read about them in a recent article in the Jackson Hole News and Guide. The big-headed ant (Pheidole megacephala) invasion continues to march across the savannas of Kenya, slowly invading plots my colleagues and I set up to test the effects of this invasion. This ant kills native ants that have a mutualistic partnership with acacia trees: the ants protect the trees against herbivores like elephants (yes, tiny ants deter giant elephants!) and in return the trees give the ants a home and sugary nectar. Where the big-headed ant has invaded, the trees no longer have their native ant defenders and are being pushed over by elephants. (You can read about my preliminary work on this topic in the New York Times and Science online). We are working to understand in greater depth what the big-headed ant does to trees, how fast these wildlife-rich savannas are losing trees, and what the consequences are for native wildlife like zebras, gazelles, rhinos, and giraffes.